Located in picturesque Texas Hill Country, Liberty Hill sits on the western edge of Williamson County. Home to approximately 7,680 people, this unique rural community provides the serenity and friendliness of a small town, along with top-notch schools, ample recreational opportunities, extraordinary natural beauty and a rich history. With an excellent transportation system and new roads, residents enjoy quick and easy access to larger cities such as Austin, where there are plenty of cultural, shopping, dining and employment opportunities to go around. 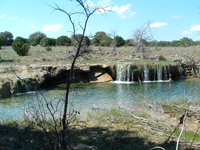 Liberty Hill is conveniently located to nearly 20 state parks and natural areas throughout the Hill Country. Thanks to the vast majority of Liberty Hill’s terrain being wooded, residents in the area are allowed to explore and enjoy the great outdoors on a daily basis. Recreational activities abound with everything from camping, backpacking and hiking to nature watching, river swimming and horseback riding. Golfers will find themselves at home on several courses in the area including Forest Creek Golf Club, Berry Creek Country Club and the beautiful Avery Ranch. An upscale 226-acre, 18-hole championship public course, Avery Ranch sits among natural limestone caverns, oak trees and rolling hills with streams and lakes winding through to provide an unforgettable golf experience. Liberty Hill offers an excellent range of housing options from rustic Texas-style homes to modern gated equestrian communities. As fast-growing as this city is, large subdivisions have been springing up throughout the rolling landscape in many of the area’s old ranches. Homebuyers can also choose to live on the riverfront of San Gabriel or even on the banks of Bear Creek. Whether you’re looking for a home that sits on a large lot with ancient oak woods or one with a stunning Hill Country view, there is something here to suit everyone’s real estate needs! Looking for Liberty Hill homes for sale? Search our local listings database for access to listings in Liberty Hill and surrounding areas. Whether you want to buy or sell Liberty Hill real estate, you can browse through properties or find a wide variety of real estate resources available on this website. If you are looking for a Liberty Hill REALTOR®, choose the Shane T. White Team! As your Liberty Hill real estate agent, the Shane T. White Team can assist you with all of your home buying and selling needs. We can provide you with access to the local listings database and offer our experience and knowledge to make the home buying or selling process easier for you and your family. Contact the Shane T. White Team today to get your home search started! The historic charm of Liberty Hill can be seen everywhere throughout the community. Residents can shop for arts and crafts, antiques, collectibles and even groceries in the early-day Texas buildings of downtown. At the original site of Liberty Hill, Fort Tumbleweed Old West Town has 16 acres of historic buildings and pieces of Texas’ past. With five school complexes, including a brand new elementary school campus, a high school campus, a middle school with a SculptureGarden, another elementary school, and an intermediate school, Liberty Hill’s exceptional school system contributes greatly to the community’s quality of life and top-notch labor pool. The new high school is set to open for the 2013-2014 school year!